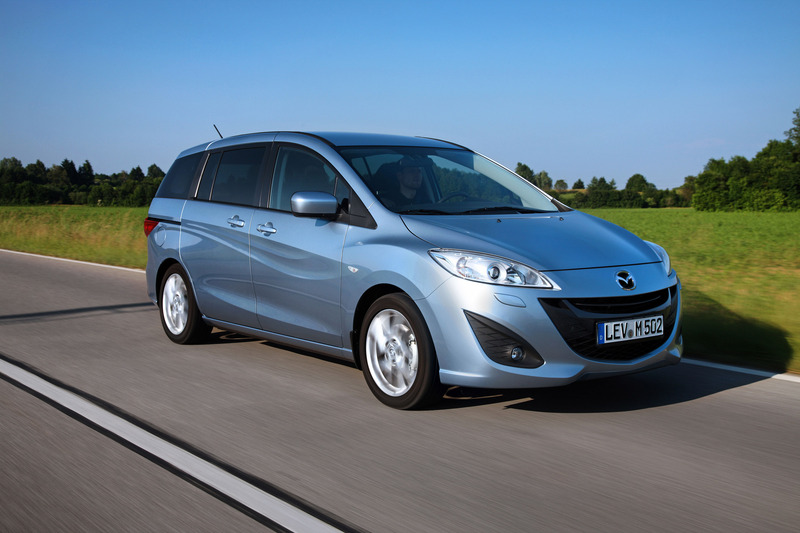 In the fall of 2010 the all-new Mazda 5 hits showrooms across Europe as successor to Mazda's first-generation compact multi-activity vehicle (C-MAV). The original model was popular with families looking for superior functionality in a compact and safe package. 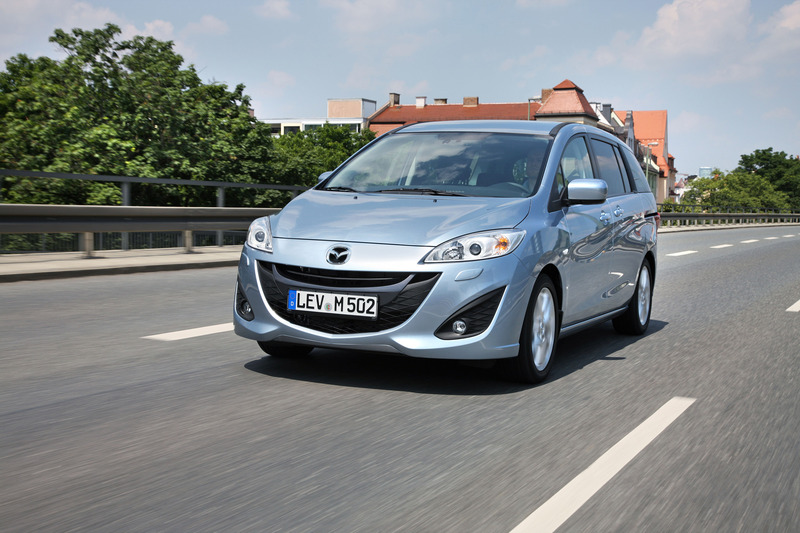 Since market launch in 2005, Mazda 5 has found 500,000 owners worldwide, 175,000 of them in Europe. It has also won 37 automotive awards, and has consistently been voted one of Europe's most reliable and safe small vans. The all-new Mazda 5 was developed from the ground up to carry forth this successful tradition with an appealing combination of great exterior styling, superior safety, and interior functionality that exceeds what people expect of a C-MAV. Not only does it have an all-new exterior with an almost sedan-like sporty look and an enhanced driving experience; but also two sliding back doors, a very large rear-door opening, leg room in the 2nd and 3rd rows that is one of the segment's largest, bigger and more comfortable seats, instruments that are easier to use, and high levels of seat flexibility and functionality. To this it adds a quieter cabin, new materials and fabrics, and appealing operating costs with new powertrains that deliver driving fun coupled to double-digit reductions in fuel consumption and CO2 emissions versus the previous Mazda 5. These features - and a long list of equipment - make the all-new Mazda 5 even better at meeting the demands of European families with active lifestyles. At present, approximately 80 percent (by weight) of components from end-of-life Mazda vehicles are recycled, particularly metal parts. Efforts continue to raise this amount by making it easier to recycle the resin, glass and other materials that comprise the remaining 20 percent. Resin parts are labelled with ISO standard material naming for easy separation, while easily-recycled resin polypropylene (PP) is used for making front and rear bumpers, instrument panels and cabin trim. The all-new Mazda 5 has a completely new exterior that employs Nagare-flow design, which has won design awards on Mazda concept cars. These elements, coupled to the new Mazda front face, a "hidden" D-pillar and new horizontal rear lamps lend it an appeal that is unique to the C-MAV segment. On the inside, Mazda 5 has a new dashboard, steering wheel and centre stack, along with new seats, materials, colours and seat fabrics for enhanced quality feel. Mazda's all-new people-carrier integrates the brand´s family face that not only makes it stronger-looking and sporty, but also improves aerodynamics and engine-cooling performance. The five-point grille is much larger, the lower bumper much more sculptured, and the new headlamps more pointed. Below these are new pointed fog lamp openings embedded deeply in the bumper. This creates a thick lower lip that rises along the outer edge of the fascia and into the fender. The fender picks-up the movement created by the fog lamp edge, carries it over the wheel well to meet a wave-like Nagare-flow character line that moves across the side of the vehicle and into the rear panel just below the door-slide rail. This unique side panel articulation is based on patterns formed when wind blows on water. It integrates the front side bumper area with the sides and backs of the vehicle so that, when combined with the character line at the lower door area, there is a sense of motion even when the vehicle is standing still. The "hidden" D-pillar - formed by covering it with glass - and horizontal rear lamps enhance the integrated flow effect front-to-back, and make the all-new Mazda 5 exterior both unique to the C-MAV segment and unmistakably a Mazda. New Nagare-flow aluminium/alloy wheel designs (16 and 17-inch) are introduced with twisted spokes, which give them a sporty three-dimensionality that contributes to the flow patterns of the Mazda 5 silhouette. Also available is a 15-inch steel wheel with a full wheel cover. There are 8 exterior colours for customers to choose from, including an all-new colour Clear Water Blue. A new dashboard design is introduced on the inside of the all-new Mazda 5 that makes the front passenger area seem larger than before, and gives the interior high levels of sportiness and style. The driver-cluster hood, for instance, is now pointed and it flows in an arch to form the outer edge of the centre stack for an integrated look of quality. The new instrument cluster now has white illumination, and a large information display is located at the top of the centre stack. The centre stack has a new frameless, open-triangle shape that integrates it into the dashboard, and an all-new audio panel design with chrome plating on the knobs. Chrome plating is also new for the gear shift knob, the air-conditioning air vents, and door handles. The meter rings, shift gate panel, door trim and the dial switches on the centre panel are finished in high-quality matte silver. A new black fabric is also introduced for an even higher quality feel. Five and seven seater entry grade seats have two different fabrics and a gradational small block pattern in the centre section. Mid and High grade fabric seats have vertical, wavy lines that express Nagare flow, and synthetic-leather piping and edge stitching with a dark blue tone. Leather seats are also available with perforations in the centre section of the seatback, and red piping and stitching, which give a sporty look. With a wheelbase of 2,750 mm, an overall width of 1,750 and an overall height of 1,615 mm, the all-new Mazda 5 delivers the perfect package for seating up to seven people comfortably, while affording great manoeuvrability. The new model is 80 mm longer than the current model, at 4,585 mm, because of its highly sculptured front end design that insures superior aerodynamic performance and improved pedestrian protection. Two sliding rear doors, a 130 mm-wide step just 439 mm from the ground, and one of the segment's largest rear door openings (686 mm wide, 1,083 mm high) give easy access to the Mazda 5 interior, even if you're holding a child in your arms. The electric rear doors can be opened automatically with the remote central-locking key or with a button on the dashboard, or manually using the handles on the doors. The driver benefits from an optimised bonnet shape and incremental seat adjustment for a wide field of vision, which makes safe city driving and parking that much easier. And of course, the steering wheel is tilt and telescopic adjustable. Instrumentation has been optimised to be easy and intuitive to use. Between the two instrument clusters is a new gear shift indicator that shows the current gear position and notifies the driver to change to the most suitable gear according to driving conditions - for optimal fuel consumption and smooth performance. The centre stack's audio control buttons - for changing disc/category, folder and file/track - are located at the centre of the audio panel and set-off by a chrome moulding for easy operation. Knobs have high-quality chrome edging, and the buttons are grouped according to their function so that they can easily be recognized while driving. A new information display is onboard that is placed high up in the dashboard to reduce eye-movement required to read it while driving. Scrolling through the displays (audio and trip computer) is easy using a single button on the steering wheel. An armrest for the front passenger is introduced. The front section of the driver and passenger seat's centre armrest is widened (15 mm) for better arm support. The all-new Mazda 5 cabin offers one of the most generous 2nd and 3rd row leg rooms in the C-MAV segment. The 2nd row seats can be adjusted to a maximum recline angle of 50º for just the right seating position, and they can be slide-adjusted by up to 270 mm. The raised floor toward the rear is designed to give the rear two rows a clear view ahead and diagonally for a ride that is more enjoyable than a flatfloor vehicle would be. There are wider front seatbacks for both driver and front passenger, and the front section of the driver and passenger seat centre arm rest is 15 mm wider. The front of the the 2nd row centre seat cushion is now 50 mm thicker and its seatback extended downward by 50 mm, which makes it more comfortable to sit in. The air vents for the all-new Mazda 5 are now higher than on the previous generation, which improves comfort in the cabin on cold or hot days and the rear passengers benefit from air vents placed under the front seats. The cabin is now quieter and more comfortable at higher speeds. Wind noise has been reduced, for instance, by designing the crescent-shaped contour at the back of the bonnet so air flows smoothly here without hitting the windshield wipers or their arms directly. The shapes of the new A-pillars reduce air turbulence and wind noise from this source. To reduce noise from being transmitted from the road to the cabin the vibration characteristics of the suspension were optimized, the framework around the door hinge pillars filled with new foam insulation to block tyre noise, and extra insulation added between the ceiling trim and the roof panels to absorb any road noise. Harshness generated by the air intake system was also lowered by moving the air ducts from the fender to the shroud section for fresher intake air. They also increased the size of the air filter and streamlining the air intake system. These steps reduce wind noise by 10 percent and provide a quiet and comfortable drive. The all-new Mazda 5 has room for up to seven people and its seats can be easily folded for a variety of seat configurations - from two seats with a cargo area for hauling larger stuff, to four seats with a perfect luggage compartment for summer vacation, to seven seats for friends and family. The three-point seatbelt of the 2nd row centre seat allows the mounting of three child safety seats if necessary. The 3rd row seats are in a 50 / 50 design and can be independently dropped flat into the floor or easily pulled out again by the strap attached to the seatback. The 2nd row features Mazda unique Karakuri functionality. Tipping the left seat cushion forward allows you to store the middle seat cushion into the space below it. You can then either drop the centre seatback down for a wide and comfortable centre armrest, or you can fold out a practical Karakuri utility box - located under the right seat cushion - into the centre space. This is especially practical, because it has a large top tray and a net below that can hold various items a family needs while driving. And when the Karakuri box is in use, a 6.3 litre storage space is made available under the right seat cushion for extra storage space. When the middle seat is folded into the side seat, it leaves a space large enough to allow access to the 3rd row, which means you do not have to first remove a child seat mounted in a 2nd row outer seat and tip the seat forward to get into the back. All in all, the new Mazda 5 has huge amount of storage possibilities including an eight litre sub-trunk box, six cupholders, two bottleholders and an 11- litre glove box. There are also two pop-up tables with cupholders in the back of the front seats. 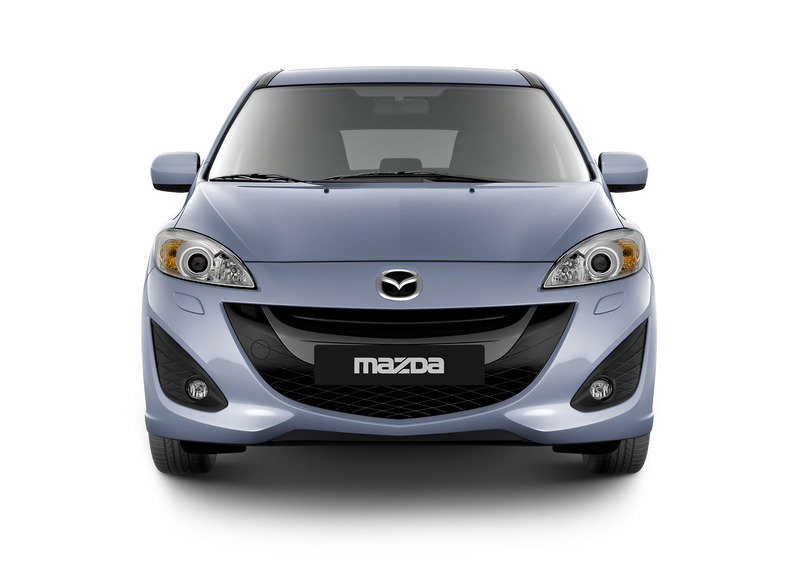 The new Mazda 5 makes all this practicality and comfort even more appealing with a long list of standard and optional equipment. For example, the all-new Mazda 5 can be equipped with an affordable navigation system with features like a large 14.7 cm touch screen monitor, hands-free Bluetooth® audio control with external microphone, integrated CD player + radio, and includes iPod®, iPhone® (via connector cable) and MP3 CD capability. Its 4 GB memory allows 99 percent coverage of Europe 's major markets including Russia using the latest maps in 18 European languages. The standard equipment package features power-adjustable side mirrors, manual air conditioning, driver seat height adjustment, power windows front and back with one-touch driver window operation, power door locks, safety touch sensor for electric sliding doors, six airbags, four-channel ABS, electric brake-force distribution (EBD), brake assist, Emergency Stop Signal (ESS), traction control (TCS) and DSC. Also standard are an AUX jack that allows you to play MP3 players using the car's audio system and a new fourspeaker radio system with digital signal processor (DSP) technology that reduces unwanted radio noise, and double tuner (exclusively for Europe) that ensures clear radio reception almost everywhere. Available are rear parking sensors, seat heating, an in-dash 6 CD changer, a FIX-EQ audio system that automatically optimises sound characteristics according to the interior space, Bluetooth® audio functionality that plays MP3 players cordless, a Bluetooth® telephone system with voice recognition and upgraded steering wheel control, a tyre pressure monitoring system (TPMS : 17" only) and Xenon headlamps - among many other features. 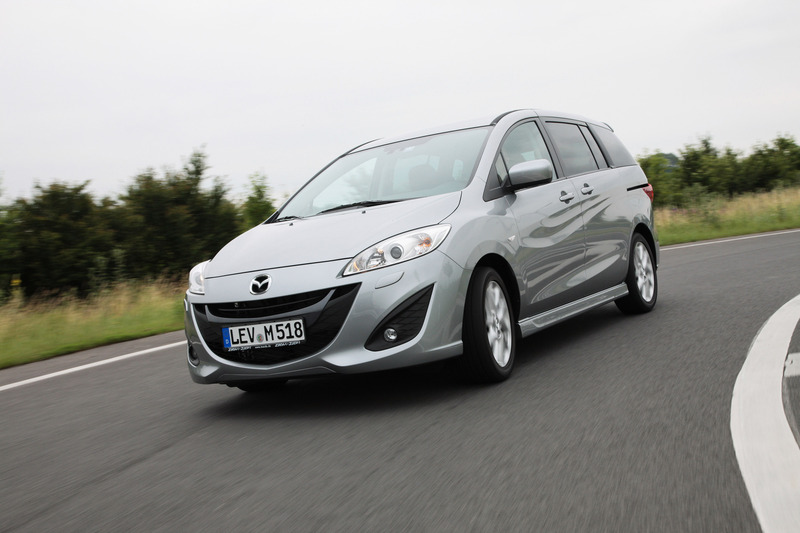 A new engine joins the updated MZR 1.8 petrol in the powertrain line-up of the all-new Mazda 5. 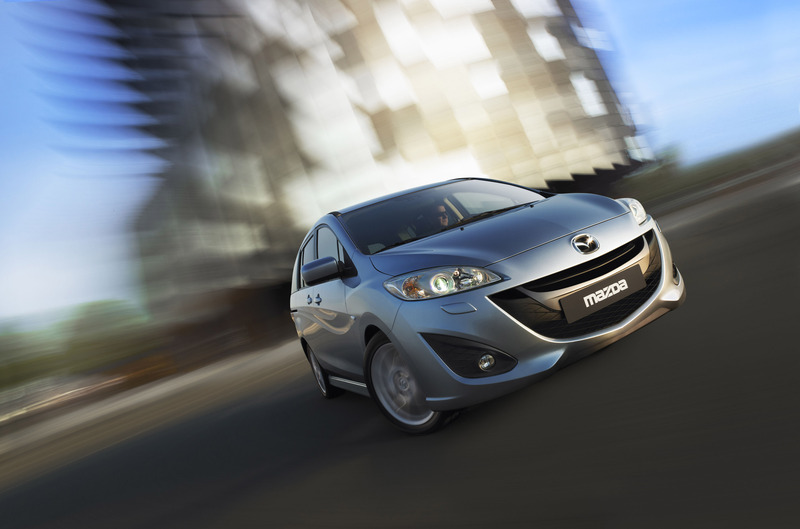 Mazda's new MZR 2.0 DISI petrol engine with i-stop technology replaces the current 2.0-litre petrol, and delivers double-digit reductions in fuel consumption and CO2 emissions. Mazda's new MZR 2.0 DISI petrol produces 110kW/150 PS of maximum power at 6,200 rpm and 191 Nm of maximum torque at 4,500 rpm with a top speed of 194 km/h for plenty of driving fun. The engine also features Mazda's stop/start system, i-stop, which saves fuel by shutting the engine off when the car is stopped at a traffic light or in a traffic jam, and then automatically restarting it when the driver presses the clutch pedal to resume driving. Mazda i-stop is unique because it employs a "combustion + starter motor-assist" system that uses engine combustion to restart the engine, rather than just an electric starter motor like conventional stop/start systems. This initiates restart in just 0.35 seconds, which is nearly twice as fast as conventional start-stop stop systems, and makes it safe, reliable and smoother. For the all-new Mazda 5, i-stop control logic was further evolved, and the system now shuts the engine off for a longer time when A/C is on, making sure that all auxiliary systems and equipment continue to operate normally during the engine shut-off phase. This means cabin occupants do not suffer any loss of comfort or convenience due to the system. The i-stop system of the new Mazda 5 2.0-litre direct-injection petrol is activated automatically when the car is started. If the driver chooses, he can deactivate the system with a switch on the dashboard. The system is not noticeable when driving after initial start-up. Only when the vehicle first comes to a standstill and the driver pushes down the clutch, goes into neutral and releases the clutch to idle the car, does the engine shut down automatically. A green indicator lamp in the driver cluster shows that the start-stop system has initiated engine cut-off as planned, which saves fuel when the car is stationary. To continue driving, the driver pushes the clutch and the engine starts up again automatically. Mazda i-stop is not a variation on other systems currently on the market. It is a completely unique solution developed solely by Mazda that needs an electric motor only during the initial phase of restart. It then capitalizes on the advantages of direct-injection technology to restart the engine fast and dependably. Once the all-new Mazda 5 comes to a halt, the engine's control module does not cut-off the engine until the cylinder air volume of the compression-stroke and the expansion-stroke pistons are equal. The driver does not notice this, because it takes only a fraction of a second, and it puts the engine in an ideal restart position. During this process, one cylinder remains in the combustion-stroke position. The restart process begins when fuel is injected directly into this cylinder, atomized then ignited, which causes the piston to move down. At the same moment, the starter motor applies a small amount of additional momentum to the crankshaft. Both these events together initiate an extremely quick restart of the engine. The decision to not use engine combustion power alone for restart was made after Mazda development engineers carefully measured how much fuel is needed for re-ignition. They recognized that using combustion power alone to restart would not only require a careful analysis of piston positioning prior to engine cut-off, it would also require a complete scavenging of unburned gases from the combustion chambers. This would mean letting the engine continue to run a bit longer before engine cut-off, which would cost additional fuel. By supporting restart with an electric motor, this could be avoided. Coordinating this type of re-ignition mechanism with the electric impulse at restart requires extremely sensitive sensors and engine control. The Mazda i-stop system monitors the piston position of each cylinder and calculates in a fraction of a second prior to engine cut-off exactly which cylinders will be most efficient for restarting later. Conventional systems identify which cylinder is in combustion-stroke position after the crankshaft is turned by an electric starter, which requires additional energy and slows down restart. The Mazda system, on the other hand, initiates engine restart immediately with a measured restart time of just 0.35 seconds, twice as fast as conventional systems. 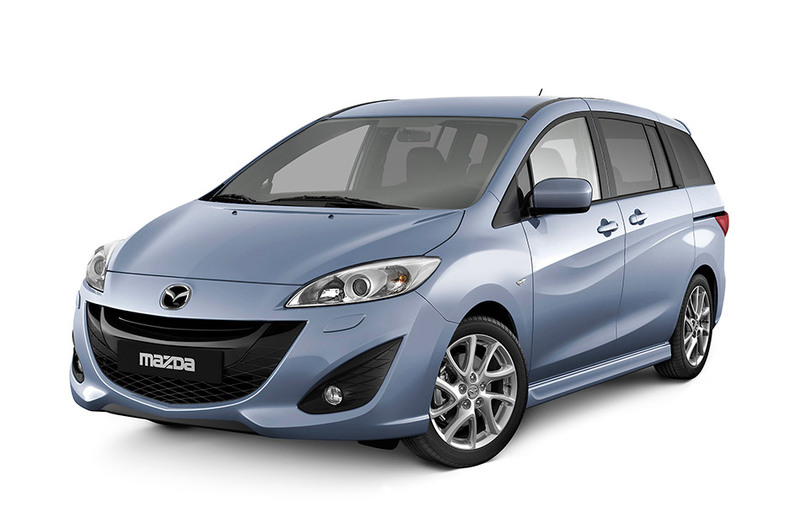 This is also the reason why the new Mazda 5 2.0-litre DISI petrol engine is so smooth and quiet upon restart. The use of an electric starter is kept to a minimum so the engine restarts without a loss in reaction time, without vibration and noise. As a result of combining DISI technology with i-stop, the new Mazda 5 is lively and fun to drive, while using just 6.9 litres of fuel per 100 km which is 13% less and producing only 159 g/km of CO2 - 15 percent less than the same-displacement engine it replaces. 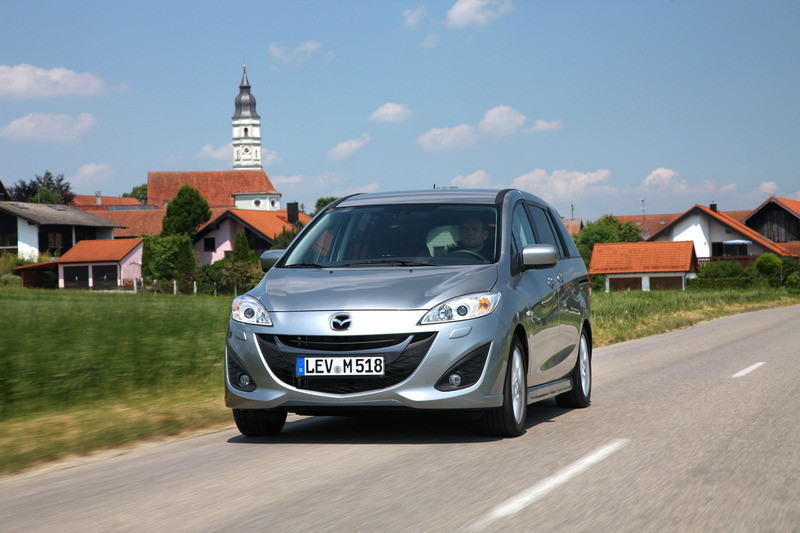 An updated version of the popular MZR 1.8 petrol engine remains in the engine line-up of the new Mazda 5. It adopts an electric control throttle valve for fuel consumption and performance feel. It employs an aluminium-alloy cylinder block, with lightweight pistons and connecting rods for low vibration and a linear driving feel. It produces 85 kW/115 PS of maximum power at 5,300 rpm and 165 Nm of maximum torque at 4,000 rpm. It is newly mated to the six-speed manual transmission with a longer gear ratio, which helps the engine lower fuel consumption by 4 percent (7.2 litres per 100 km), CO2 emissions by 6 percent (168 g/km) and comply with Euro V.
Moving the intake-air ducts to the shroud section helps reduce the temperature of intake air and delivers improvement in fuel efficiency. Improving engine cooling by extending the width of the radiator by 25 mm makes the fans run with a lower frequency. Optimization of intelligent throttle valve control and the knock limit control system help lower fuel consumption. When developing the all-new model, Mazda focused on achieving a "Harmonized Dynamic Driving Feel" (named Toitsu-Kan) and the result is exceptional linearity, whether accelerating, turning or stopping that provides both driver and passengers with a pleasant ride feel. Furthermore, the all-new Mazda 5 is designed with more ultra and high-tensile steel reinforcements to be lighter, stiffer and more crash-resistant than its predecessor. Engineers added new suspension, steering and aerodynamic components that deliver a more linear steering feel for more control and predictability. 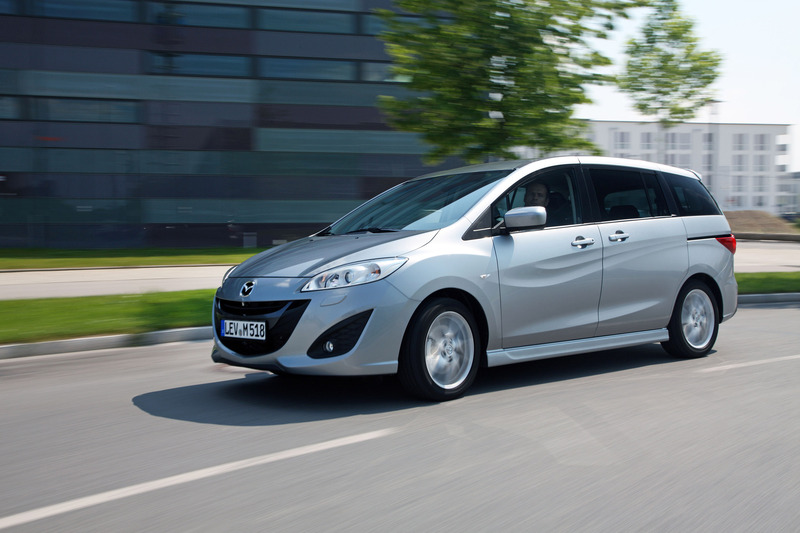 Furthermore, the new Mazda 5 is the first model globally to be introduced with Mazda's Brake Override System. Chassis engineers improved local stiffness at locations where it would make controlling the vehicle easier. They enlarged the cross-sectional profiles for the D-pillars, the upper part of the liftgate, and at the corner radius of the liftgate opening, which lowers liftgate opening displacement by 17 percent when compared to the previous Mazda 5. Additional spot welds were added to the apron section of the front damper tops and at the base of the B-pillars, and a closed-section structure was adopted for the rear pillars to increase rigidity at belt-line level. The suspension layout for the all-new Mazda 5 employs MacPherson struts in the front and a multi-link suspension in the rear, twintube dampers in the front and separate coils and monotube dampers with integrated rebound springs at the back. To realize a more linear driving feel compared to the outgoing model, engineers introduced new rubber couplings to the steering shaft joint section and stabilizer mounts, modified the dampers and bushings for both the front and rear suspension, and increasing all spring rates. These efforts deliver a smoother response during acceleration, deceleration and when cornering, and improve straight-line stability when driving at motorway speeds. 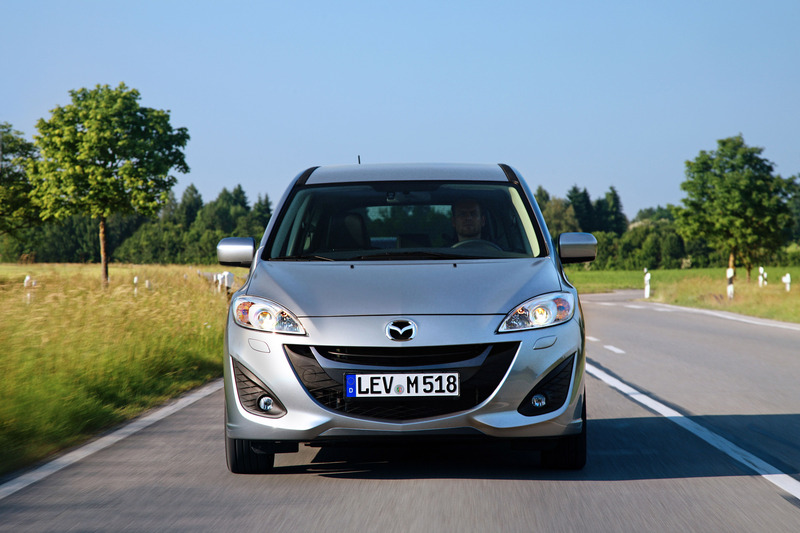 The new front end design of the Mazda 5 not only sets it apart from other vans, it also contributes to aerodynamic performance that is unusually good for a C-MAV. A new front lip spoiler, a flat engine undercover and front tyre deflectors work together to channel air under the vehicle efficiently, which helps keep fuel consumption down. The design of the vehicle is also optimised to improve lift balance at the front and back. 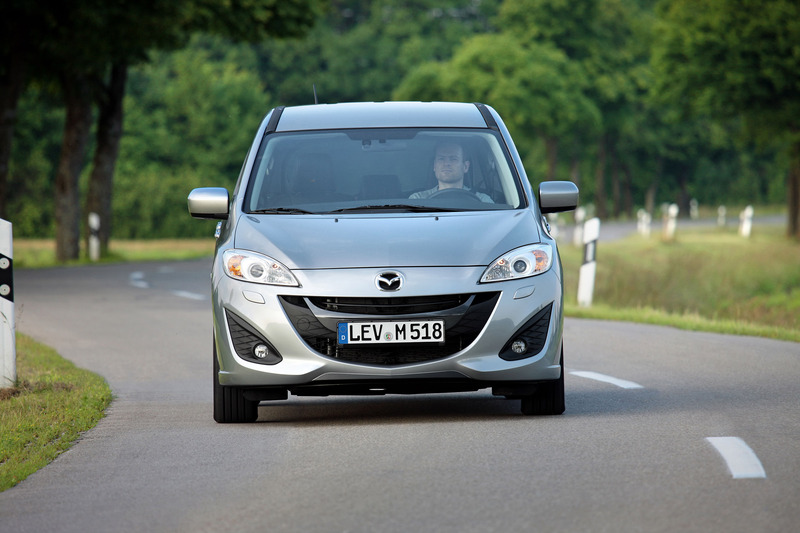 These measures give the all-new Mazda 5 a drag coefficient of just 0.30, one of the lowest in the C-MAV segment. The all-new Mazda 5 features an evolution of the outstanding safety package that made the current Mazda 5 one of Europe´s safest mini-vans. To achieve this, safety engineers further evolved the Mazda Geometric Motion Absorption (MAGMA) system to create a new body shell with strong Triple-H structures in the floor, sides and roof; then added additional body reinforcements to make it even better at absorbing impact energy in rear-world accidents. The cabin is now even stronger with new reinforcements in the roof, ultra-high tensile steel introduced to the centre pillars and high tensile steel adopted at the side sills. Its doors are now stronger and less likely to intrude upon impact. Their edges overlap with the body to a greater degree when closed, and special door latches are added to the front and rear of the sliding doors to reliably keep them shut during impact. The side doors' two impact beams are newly positioned and their structures changed from the previous single-hat to a double-hat design using ultra-high tensile steel, making them even more resistant to deformation. Also new are the locations of Mazda 5's large energy-absorbing pads on the inside of the doors and the door trim, and the structure of the armrest on the door trim - which now has a crushable design - all of which lowers the shock to occupants in the event of a side collision. The 2nd row seatback frames have been strengthened as well and are now better at resisting the forward shift of luggage during the event of a front impact when the 3rd row seats are down or not present (Europe also offers a five-seat version). 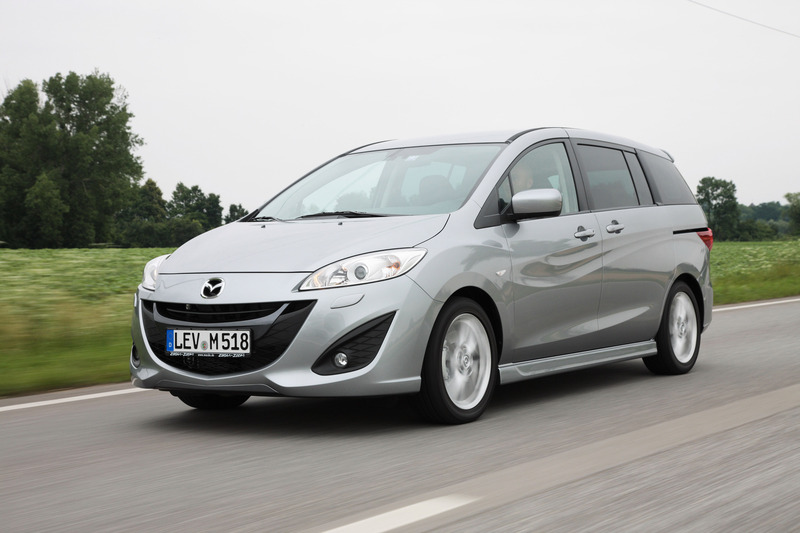 The new Mazda 5 is also safer in the event of a rear-end impact, where the new body is better at absorbing energy and protecting the fuel tank. The frame surrounding the fuel tank is made of high tensile steel in two plates each with a different thickness, and the frame members are straighter and have an optimized cross-section. On the inside, passengers are protected by a passive safety package with six airbags (front, side and curtain), three-point seat belts with pretensioners and load-limiters at the front seats, a crushable brake pedal and horizontal movement type shock absorbing steering column, a seat design and head restraints that help reduce whiplash during in the event of a rear impact, ISOFIX child safety seat anchors and tethers in 2nd row, and soft, impact-absorbing interior surfaces. Using the new Mazda 5's two electric sliding back doors is now even safer with the first-time installation of a touch-sensor strip that runs the length of the door. If enough force is applied to the strip by a person's body or some other object and causes the strip to deform even slightly, the sliding door stops instantly, reverses direction and returns to the open position again. Mazda's new people-carrier is also safer and easier to use in city driving with the introduction of a park-assist system. It uses four sensors in the rear bumper that continuously measure the distance to any object when parking in reverse. 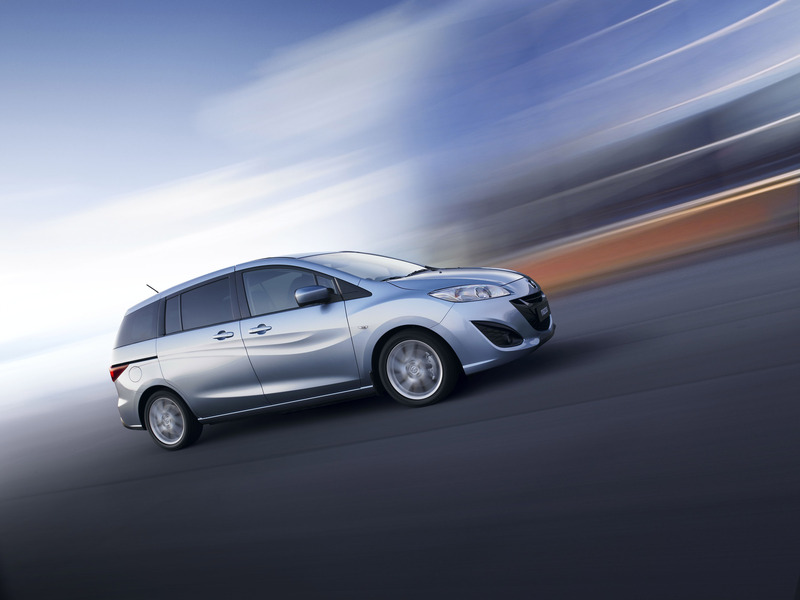 The brake system of the all-new Mazda 5 was developed to contribute superior deceleration and - when combined with suspension, steering and body updates that deliver a more linear steering feel - to contribute to more predictability and control. The new Mazda 5 is equipped with large 300 mm ventilated disc brakes in the front (278 mm for 15-inch wheels) and 302 mm rear brakes (280 mm for 15-inch wheels), four-channel ABS, electric brake-force distribution (EBD), brake assist, Emergency Stop Signal (ESS), traction control (TCS), DSC and six airbags. 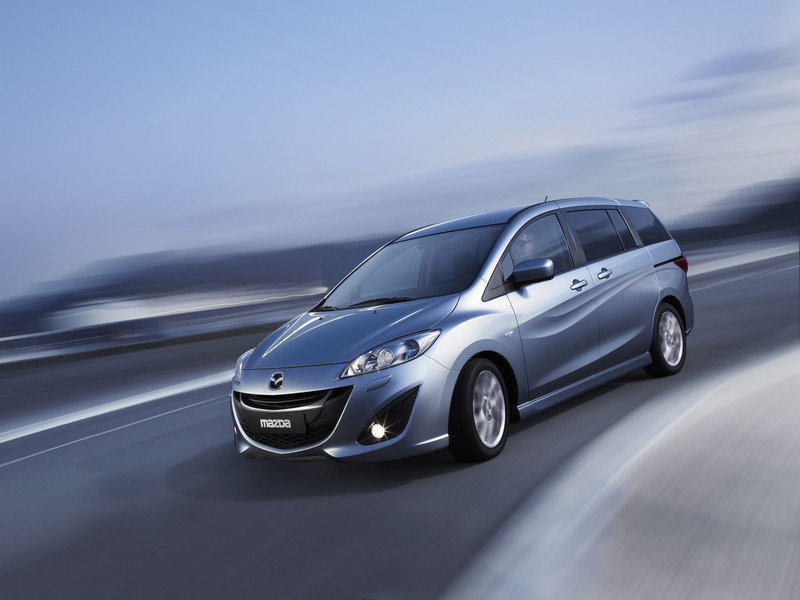 The all-new Mazda 5 will be launched globally with Mazda's Brake Override System. This system always prioritizes the brake pedal over the accelerator pedal should both be engaged simultaneously, allowing the vehicle to be brought to a safe stop. The all-new Mazda 5 has evolved its pedestrian protection system even further by optimising the structure of the steel stiffener along the front edge of the hood so it crushes more easily when struck. This is combined with sufficient space between the hood and engine, between the face of the front bumper and the bumper reinforcement - which makes it absorb energy efficiently - along with energy-absorbing material in the hood and front bumper.